Description: The inspiration for the CSX primer scheme must have come from the ex-QNSL unit! Description: CSXT 5213 & CSXT 5217 (grey ghosts) eastbound at Grasshopper WV. Description: A pair of new ES44DC's at Oak Island. Description: ES44DC pressed into service still in primer before its "Dark Future" paint. Description: Q283, with a wonderfully off-balance nose logo, heads west with CSX 5213 and 9043. Description: Q283 smokes it up in the bone-chilling cold. Description: Q283 crosses the NECR main with 9043 still smoking away. Description: Heading into Cleveland on NS rails having just crossed from the CSX main. 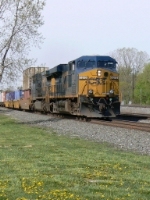 Description: CSX powered TOFC train crosses from CSX to NS rails at Berea. Description: Q416 rolls through ashland with a gevo leading a former conrail sd40-2 on it's way to cumberland. Description: lay off, its my first shot w/ the new camera, im not used to it taking that quick. Description: train Q703 the trash train struggles through ashalnd behind two Hoovers..boy was he ripe today! 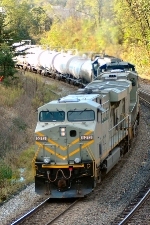 Description: CSX 5213 on an eastbound engine move. Description: Sunnymeade Rd., 0739 hours. Description: Sunnymead Rd., 1759 hours.